Dave Duggal, Founder & Managing Director New requirements demand new methods, this is the essence of transformation, and those that miss the point are inevitably disrupted. The founders of EnterpriseWeb understood that static, tightly-coupled and brittle applications had to give way to dynamic, loosely-coupled and adaptable solutions. Back in 2009, the Company set out to build a platform to help organizations flexibly connect business silos, layers of IT, partner networks and industry domains for dynamically integrated operations. EnterpriseWeb re-imagined the middle-tier for the 21st century: lightweight; horizontally-architected; loosely-coupled; and late-binding. The company name itself is a fitting compound of Enterprise-class and Web-scale. Fast-forward to today, with organizations around the world struggling to become agile digital businesses, EnterpriseWeb is now in the right place at the right time with a proven technology. The company’s platform radically simplifies distributed computing with a unified solution for developing, testing and deploying highly modular applications. The platform promotes configuration over code; enabling customers to model complex distributed domains and compose policy-controlled dataflow processes. 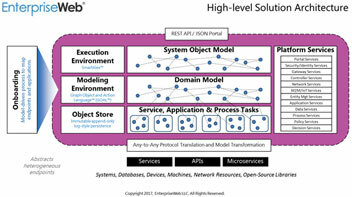 By flattening the middle-tier, EnterpriseWeb can present a single pane of glass for hybrid integration and automation. The platform acts as a distributed Operating System or an application fabric, which enables virtually-centralized discovery, composition and policy management of distributed endpoints. While it can replace many tools, it also connects legacy systems, open-source libraries, and third-party services in mesh-based solutions. The platform manages threads and resources, and provides shared libraries and tools. Platform services provide support for non-functional concerns (e.g. security/identity, business compliance, IT governance). The platform features a universal interface (REST API or JSON-based portal with role-based access control) that provides access to an intuitive design environment and a cloud-native execution environment. EnterpriseWeb supports “intent-based” interfaces that de-couple applications from implementations, allowing customers to model application logic in declarative policies without having to specifying all the technical details in advance. They can describe “what” they want, without statically encoding “how” it will get done; the solutions are late-bound. At run-time, an event-driven execution environment dynamically constructs pipelines for DevOps, Cloud, IoT, Enterprise Network services. The run-time engine interprets models based on interaction-context (i.e. live metadata and real-time state) and weaves together all of the elements of a solution. The design environment is based on the company’s Graph Object and Action Language (GOAL™). “GOAL is a dynamic language for declaratively modeling executable objects as a set of metadata and link references to domain concepts and types,” explained Bill Malyk, Co-founder and Chief System Architect. 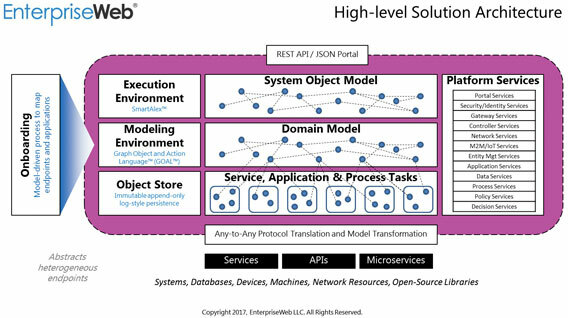 “It provides a common machine-readable pattern for modeling heterogeneous endpoints, normalizing them as GOAL objects.” Put more simply, EnterpriseWeb automates interoperability using a domain model that provides the common semantics to make diverse solution elements discoverable, composable, and manageable in the same manner. Bill went on to describe the run-time technology. It is based on Intelligent Agents that handle requests, interpreting GOAL objects using live metadata and real-time state to dynamically realize services based on interaction-context. The Domain concepts and types direct the agent, which connects, transforms, mediates, integrates, coordinates, and configures endpoints in real-time. The agents allow for the advantageous properties of a loosely-coupled, stateless, web-style architecture (e.g. scalable, resilient, adaptable, etc.) by providing a scalable means for dynamic late-binding, instead of resorting to static and synchronous integration. The rise of EnterpriseWeb coincides with increasing demand for interoperability and the challenges CIOs face coping with that demand. Manually integrating and re-integrating individual endpoints, and coding and re-coding applications simply won’t scale; there’s not enough budget or time. While there has been an explosion of open source tools introduced to help automate various aspects of Continuous Integration and Continuous Delivery (CI/CD) pipelines, integrating and maintaining these tool chains is not easy. At one level, this is a successful community oriented development strategy; everyone is leapfrogging off everyone else, iterating to a new application architecture for our organizations. It’s the last bit that’s problematic. Ad-hoc, agile, fail-fast practices are the diametric opposite of Enterprise Architecture; growing adoption is exposing operational challenges. The fundamental problem is that DevOps tool chains are like middleware stacks; discrete components manually integrated to support a pipeline from Dev and Test to Production Deployments and Lifecycle Management. As with middleware generally, accidental complexity grows with each new cool tool added. 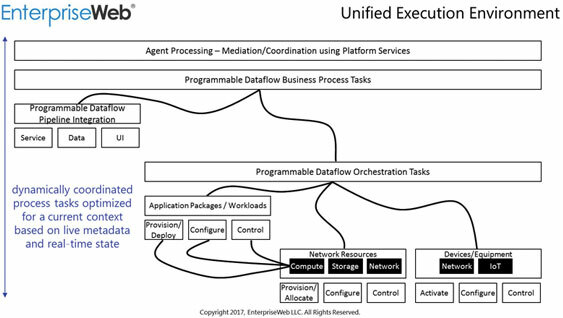 Enterprise Architects have struggled with this for the last ten years with Service Oriented Architectures (e.g. Business Process Management, Big Data, OpenStack, etc. ), where every problem in middleware is solved by more middleware. First, these are open source “projects,” not products. While some are quite mature, others are still prototypes. Second, these projects are architected by separate teams using different software languages, data models and conventions— integrating them is rarely straight forward. Third, projects are being updated all the time, but there is no great way to automatically plug-in updates into a statically integrated DevOps tool chain. It is not uncommon for updates to be incompatible with what has already been integrated. "By flattening the middle-tier, EnterpriseWeb can present a single pane of glass for hybrid integration and automation"
Fourth, DevOps is a victim of its own success, the business wants to automate a greater variety of workloads, but the tool chains tend to be limited to fixed templates, which inhibits diversity and complexity. Of course most businesses are not homogeneous or simple, they have ‘hairy’ enterprise-class workloads that need to be supported. Fifth, standards are an after-thought. DevOps is an open source world, which emphasizes learning by doing and rapid iteration. Standards haven’t generally been a consideration of the open source community, every API has its own data model so standards integration is done as one-off custom development, increasing tight-coupling. Since standards relate to interoperability, this item also impacts 1-4. Bill and Dave concluded that the open source community offers lots of clever developer tools, but it lacks smart software abstractions. It is all bottom-up thinking, but the success of Services, APIs, and now Microservices has every Enterprise Architect wondering how to manage all of this at the application layer. How do you build scalable, resilient, dynamic processes across this heterogeneous and ever evolving landscape? While some open source adherents may recoil to even an objective critique, they would risk missing the point and an opportunity. The business only cares about “what” (e.g. capabilities) and it has never really cared about “how” (e.g. middleware). That being said, they are always impatient with IT and are frustrated by the longstanding promise of business agility. No combination of ESBs, API gateways or Process engines has delivered. 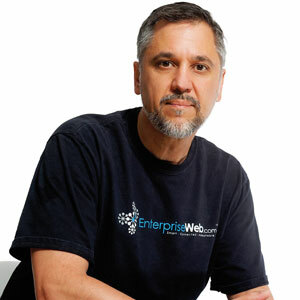 EnterpriseWeb provides a fabric for flexibly connecting people, information, capabilities, and tools in collaborative processes. It is open, extensible, and agnostic as to what it connects. In this way, it provides modern scaffolding for composable domain solutions; an enabling technology for the way we need to work today. While EnterpriseWeb has done award-winning work in IoT, life sciences, and Enterprise applications, it’s most exciting use cases are in Telecom where it is demonstrating advanced distributed computing concepts in collaborative industry projects. One high profile project in the TM Forum is called the “Digital Marketplace,” which is supported by AT&T, Orange, Verizon, Vodafone, Telstra and China-Mobile. It is one of the largest projects in TMF history. It demonstrates a fully working model of an open multi-vendor eco-system featuring diverse capabilities from IBM, Oracle, Metaswitch, EXFO and Symantec running on the EnterpriseWeb platform. All of the vendor applications are onboarded, composed, tested, deployed, and managed using the TMF’s Open APIs for standards-based interoperability. This is extreme DevOps in action.